Your cheaper clothes don't have to fall apart after a year. Care for them correctly and they'll last long enough to be out of style. Clothes can make the man — but cheap clothes don’t make you a cheap man. We have to start from somewhere. Most of us aren’t at the level of rotating out pairs of Allen Edmonds shoes with our Tom Ford suits, and that’s OK. It really is. To be fair, though, a lot of the price from high-tier, enviable brands is from the name. That sheep in the ribbon from the Brooks Brothers logo is just a sheep — it’s no vicuña, no matter how soft that wool is. Like all things in life, if you take care of cheap clothes, they will last you. Hell, even with a cheap suit on, you’ll still be better-dressed than most people if it fits and you wear it correctly. A fused suit — as opposed to a stitched one — will get you the same amount of double takes and the inevitable compliments (and sideways glances and sharp comments from guys angry that you look better than they do.). We all have a favorite outfit. One that we could and would wear to any event anywhere. The outfit in which we’d want to be buried. Whether it’s a Hawaiian shirt or a completely bespoke suit, it doesn’t matter: If your clothes are cheap(er than you’d like), it doesn’t necessarily mean they’re worse-looking, worse-fitting or will dissolve in the rain. You just have to be careful. This isn’t a call for meticulously arranging outfits per day of the week—although that’s no slam on those who do—but you can’t be wearing the same set of clothes every day. Strangely enough, if you treat your cheap clothes as you would a bespoke Tom Ford suit or a pair of Park Avenues, they’ll last longer. In fact, all clothes, if treated with that kind of reverence, will last longer. The bottom line is that taking care of your clothes can be a chore, yes, but for those of us who bow to the altar of the cloth—regardless of the material from which our particular fetish is hewn—the gospel of care will exalt us to sartorial salvation. We live in an amazing age. We have “printers” that can create skin. We have 3D televisions that don’t require glasses. Self-driving cars, even. But there’s no substitute for carefully drying your clothes. By hanger. And letting the garment dry the good old-fashioned way. It keeps shirts stiff (in a good way) and prevents your clothes from being exposed to heat. And although we may love the feeling of a toasty shirt fresh out of the dryer on a cold winter day, heat is a killer. It can ruin fabrics and it mutes brilliant colors. Using a drying rack, hanger or even a clothesline however, helps clothes stay pristine longer, granted you follow the washing instructions too, of course. As you amass a wardrobe of more than just T-shirts and jeans, laundry becomes more exact. You can’t just guess anymore with these items, and throwing a pair of trousers—even if they are considered washable—into the machine with your other clothes just because it can fit and it was at arm’s length is no excuse. 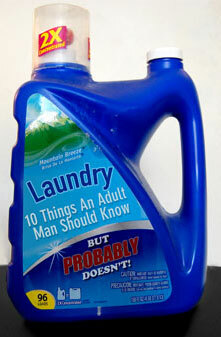 Read your labels when doing laundry. They’ll save you grief and will elongate the life of your favorite clothes more than you’d think. 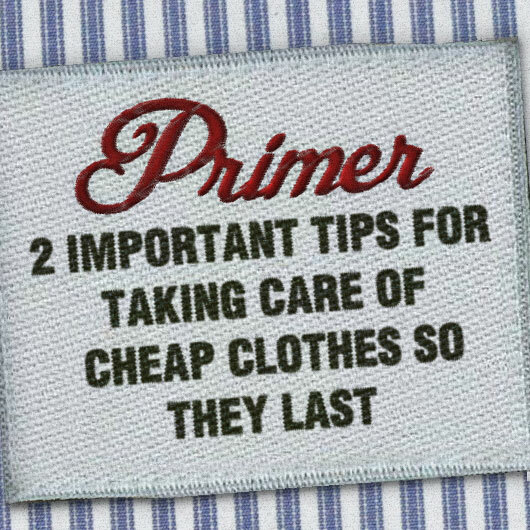 Although we touched on this before, there’s not enough that can be said about taking proper care of clothes. Whether that means steaming a cheap suit, fuzz shaving a pilled sweater or actually following the PROFESSIONAL DRY-CLEAN ONLY tag, it’s difficult to say. But really, this is just reinforcing many of the points brought up above. There is no difference, when it comes to care, in cheap and expensive clothes. They’re both high-maintenance if you want to keep them looking fresh. Because, in the end, whether you’re wearing BOSS or Wal-Mart, as long as it fits well and as long as it looks nice, no one’s going to call you out on it. Well, almost no one. The one guy who does will be speaking Italian anyway, so, in classic Primer fashion, we’ll keep spreading knowledge. The most suitable answer, in the situation outlined above, is Vaffanculo! Great article. What’s the point of the no heat setting on dryers? Is that the same as hang drying something since no heat is used and clothes are just tumbling about? Yeah, that’s known as tumble dry. It’s for delicate fabrics or things that can shrink easily. I usually hang dry my dress shirts, but then iron them afterwards. So I am still actually exposing them to heat. Is my method counter productive? The symbols are absolutely useless on a tag. Until now. Except I’ll probably forget them anyway. At least I got the dots, though. Can’t they just use text!! I didn’t know that color fading could be caused by the dryer… Explains so much. I’ve only recently started actively hang-drying most of my clothes. Never going back to using a dryer. The clothes look better of course, but man they SMELL better. They keep a lot of the scent from the soap. Normally to get my clothes smelling that good our of a dryer I have to throw in 3-4 extra fabric softeners. And yes, your clothes last MUCH longer. All you really have to do is look at the dryer’s filter too see just how much of your clothing you lose after each cycle. Hi, nice article. In Italy we only do outdoor drying. Dryers are almost rare here. And everyone has his own wash machine. Using a dryer for our mothers is like to do a sacrilege. Two years ago I was for sometime in NY city. There I had my first, and I hope the last, experience with a dryer. It ruined most of my clothes (furtunately nothing valuable). Well i would love purchase some Champagne bridesmaid dresses like https://www.shoppersfeed.com/monique-lhuillier-bridesmaid-wedding with minimum budget. Do anyone have any idea?